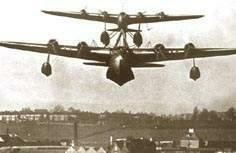 Between the wars, aviation had made giant leaps from its humble beginning. The First World War had seen the development of military aviation, and the time had now come to pioneer the civilian air routes. Aviation was a blessing for the Nations with a vast Colonial Empire. Yet, to fly non-stop to territories located several thousands of kilometers away was not an easy task due to the limited range of the airplanes of the era. The United Kingdom was one of the major Country most interested in this new mean of transportation considering the vastness of its Colonial Empire, where as the saying goes "the sun never set". 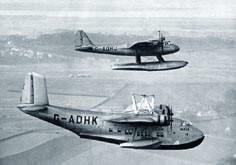 During this « long range » race, where each Country was developing its own technology, the British Company Imperial Airways opted for the seaplane. The Short Company developed for this purpose a large flying boat, the Short Empire Boat, and over fifty of those were built. This prestigious aircraft equipped with a bar and a galley, served for a less than original project. Robert Mayo the engineer, who conceived the Empire Boat, also dreamed of a procedure to extend significantly the range capability of the seaplanes. Since a large amount of fuel is used for takeoff and climb to cruise altitude, he developed a four-engine floatplane of average size, the "Mercury", which was mounted atop a Short series "C" flying boat baptized "Maïa". The first public demonstration occurred on February 6, 1938. The Maïa carried its payload and the Mercury released from the transporter at an altitude of 225 meters. The Mercury was not used for passenger's transportation, only as a mail carrier. The composite ensemble took-off using only the engines of the transporter, which carried the Mercury as far as its fuel reserve permitted it. Once the Maïa reached its point of no return, the Mercury which still had its fuel tanks full started its engines, and separated itself from the transporter, continuing alone to its destination, while the transporter returned to its point of departure. During the race for long distance flights, the Short Mayo established a world record from the 6th to the 8th of October 1938: no less than 9700 kilometers between Dundee (Scotland) and the mouth of the Orange River (South African Union) at an average speed of 228 kilometers per hour in spite of the head-winds. Although the commentaries of the news media of the era were enthusiastic, this system was only a "make do" arrangement that would be later on rendered obsolete by more classical, lighter weight aircraft, equipped with more efficient engines. War had started again: the Maïa was destroyed during a bombing in 1941. The Mercury now useless as an aircraft was delivered for scrap metal, and its precious aluminum would be used for the war effort. German aviation engineers' answer to increase the radius of action: the diesel engine, which possessed reduced specific fuel consumption. 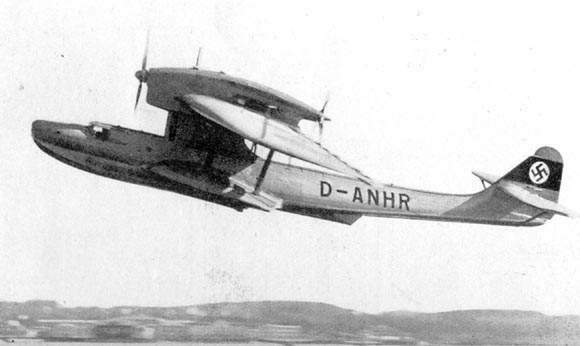 On March the 27th through the 29th 1938, this Dornier Do18 equipped with two Junkers 205 diesel engines flew from Plymouth to Caravellas (Brazil) - an 8,250 kilometers non-stop flight. To minimize the takeoff fuel consumption, the aircraft had been catapulted. 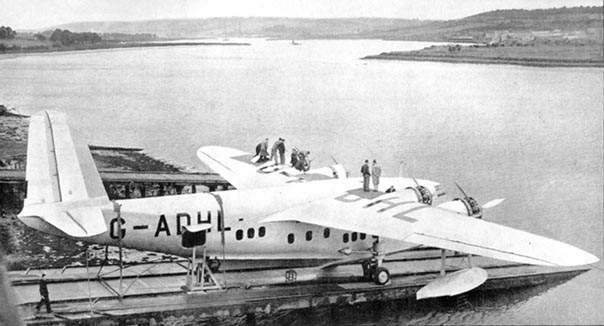 The Canopus, the first Short seaplane of the "C" series on one of the factory launching ramp. 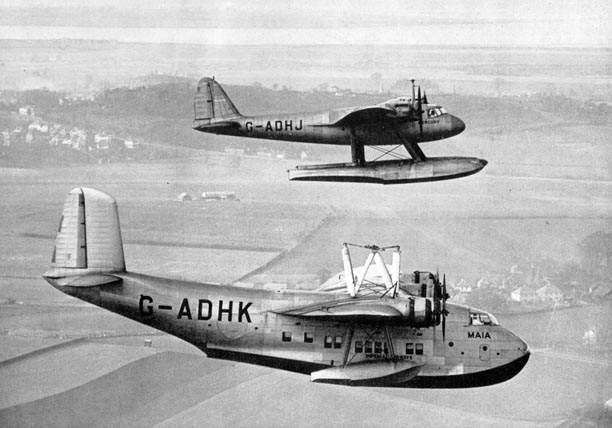 This aircraft was somewhat successful, and from it Short derived the famed military seaplane Sunderland, which after the war was also used as a civilian transport, namely during the Berlin Airlift. The « Maïa » composite at anchor. 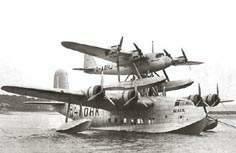 An aeronautical scene out of the ordinary: a flyingboat carrying a floatplane in "piggyback" fashion. Note that on this photo the Mercury's engines appear to be running.